When they first hit the market, rangefinders were cumbersome and costly. Fortunately, thanks to advancements in technology, modern rangefinders weigh and cost less than their predecessors. Today, rangefinders are among the most purchased sporting and hunting equipment in the US and for good reasons. These high-tech gadgets come in handy when you want to know exactly how far a target is from you. So are you looking for the best rangefinder? Then you have come to the right place. In this page, I am going to introduce you to some of my all-time favorite rangefinders. One of the wisest decisions you can make as a hunter or golfer is to invest in a quality rangefinder. Sadly, shopping for the best rangefinder is not the easiest of tasks and the many contradicting online rangefinder reviews do not make things any easier. However, with the right information identifying the best rangefinder to suit your needs can be a breeze. To help you on your search I have compiled a list of rangefinders based on my own personal experiences. To make things easier I have categorized these rangefinders according to their uses. It is worth noting that I have had the pleasure of using each one of these rangefinders at some point in my adventurous life. Binoculars Guru recently Reviewed some of the best rifle scope of 2017. If you are a avid hunter or shooter you can check that reviews. When shopping for a rangefinder, whether for golfing, for hunting or for archery practice, there are some fundamental factors you should consider. In this section, I am going to cover some of these fundamental factors that distinguish quality rangefinders from poorly made ones. The range is the distance that a rangefinder can get a clear reading from a target. In most cases, a range is measured in yards. However, there is a wide variety of rangefinders that display readings in both meters in yards. If you are looking for a rangefinder for hunting, one with a range of beyond 1000 yards is recommended. Normally, for marketing purposes, rangefinder manufacturers exaggerate the range of their rangefinders. However, there are some rangefinder’s that do have a range of beyond 1000. For archery, a rangefinder with a range of 500 yards will do just fine. A rangefinder’s features should correspond to its applications. In this regard, if you want a rangefinder for hunting in forested areas, it is important you get one with angle compensation. This is because very rarely will you be in a position where you will be able to view a target in a straight line. Also, the rangefinder should have optics capable of working in all light conditions. On the other hand, if you are interested in buying a golfing rangefinder, a small less complicated rangefinder will do. Especially since the use of rangefinders with angle compensations is prohibited in some golf tournaments. Rangefinders are designed to correspond with their uses. As such, rangefinders used for archery feature a vertical design while those used for bow and rifle hunting has a horizontal design. The latter design is ideal for hunting rangefinders as it offers ease of use and improved stability. Additionally, horizontal rangefinders are lightweight and are thus easier to carry in the rough terrains encountered when hunting. As with all other optical instruments, the magnification of rangefinder ranges from 4X to as high as 8X. Low-cost rangefinders have low magnifications while high-end ones have higher magnification. A rangefinder with a 4X magnification offers a range of approximately 600 yards, maximum while one with a 6X or 7X magnification offers a range of 1000 yards. For archery, a 6X or 7X magnification is ideal while for hunting a higher magnification of 8X that yields a range of approximately 1600 yards is recommended. For hunting, it is important you consider how ergonomic a rangefinder is. This means you have to look at a rangefinder carefully. It might not seem a big deal, but a rangefinder’s brand will help you evaluate its performance. For example, Bushnell a leading manufacturer of optical instruments has sold 12,000 rangefinders. This means that there is something about the company’s products that makes people buy them. Thus, the reputation of a brand will give you the confidence to purchase. Cost is another important factor to consider. The basic rule is that you get what you pay for, so for a premium rangefinder you have to be willing to invest in one. Also, it is important to consider the size of a rangefinder and how easy it is to carry it in your pocket. As of 2010, the number of Americans involved in bow hunting stood at 3.64 million people. With such a vast majority of Americans being involved in this age-old practice, the demand for bow hunting rangefinders has never been higher. So which is the best bowhunting rangefinder? Here is my pick of the four best rangefinders for bow hunting. I have selected these rangefinders based on how they performed in the great outdoors as well as their accuracy. Leupold is a company synonymous with the manufacture of high-quality spotting equipment. This Oregon based manufacturer is behind one of my favorite bow hunting rangefinder, the Leupold RX-1200i TBR Rangefinder. As its name suggests it is a compact bowhunting rangefinder that can comfortably fit in your trouser pockets. Weighing a meager 1 pound, this digital laser rangefinder features multi-coated optics that delivers exceptional clarity. Personally, I found this rangefinder’s red LCD digits to be better than the conventional black or gray digits found on most rangefinders. The red LCD digits appear clear and crisp in all lighting conditions. This bowhunting rangefinder is accompanied by a lanyard that you can use to attach the rangefinder to your backpack and a carrying case. In all honesty, the Leupold RX-1200i is a great or best bow hunting rangefinder I have ever used. Bushnell is a leading manufacturer of optic instruments. Thus, it should come as no surprise that the Bushnell 202442 The Truth ARC 4x20mm Bowhunting range finder is one of my favorite rangefinders. Weighing a meager 5.6 ounces, this is a beautifully made range finder. The range finger’s 4X magnification lens provides a horizontal view of 7 to 199 yards. As one of the best bow hunting rangefinder, the Bushnell 202442 boasts of cutting edge technologies aimed at improving your bow hunting experience. One such technology is the ClearShot technology that provides instantaneous feedback on your shots. To ensure that it outperforms the competition in harsh weather conditions, Bushnell opted for a rubberized armor in the construction of this bowhunting range finder. The 202442 can be calibrated to correspond to the speed of your arrow. This means that you no longer have to worry about your arrow’s clipping branches. In essence, this pocket-sized rangefinder performs exceptionally well and is also affordable. Despite its many cool features, calibrating this rangefinder is not easy. Personally, I had to consult a technician. Also, as with all rangefinders the 199 yards range indicated by the manufacturer is not what you really get from this compact rangefinder. Another Bushnell model that deserves a place among the best bow hunting rangefinders is the Bushnell Scout DX 1000 Rangefinder. Constructed from a combination of plastic and rubber, the Scout DX 1000 ARC rangefinder is both lightweight and durable. The 6X magnification lens on this rangefinder works well in almost all light conditions. As for its range, the Scout DX 1000 has a maximum range of 1000 yards. For sharp clear viewing, this rangefinder is equipped with a diopter for adjusting the eyepiece. Also, the entire unit is 100% water and fog proof. Thus, you do not have to be worried about its performance during the rainy season. To make it easy to carry, this Bushnell rangefinder comes with a carrying case and a neck strap. Furthermore, the rangefinder weighs 13.6 ounces. If the many contradicting reviews are anything to go by, the performance and quality of this rangefinder has elicited mixed reactions from hunters. As per my experience, this is a good rangefinder but is not the best. For starters, this unit is practically incapable of pinpointing anything beyond 300 yards. Thus, Bushnell’s claim of 1000 yards max range was a big letdown. Also, although its works well in all light conditions, I found that it struggled in low light and works best during the day. If you are looking for a powerful crossbow range finder, the Bushnell Tactical 202421 Elite is a powerful and a great range finder for bow hunting. For it to be the best bow hunting rangefinder, Bushnell opted for a 7X magnification lens that delivers unrivaled clarity. This crossbow range finder marks a significant improvement from the 202442 model in regards to range. In this regard, the Tactical 202421 Elite model has a range of 5 to 1,760 yards. The 7X magnification lens on this crossbow range finder is backed by what Bushnell calls VDT or Vivid Display Technology. This revolutionary technology greatly improves the rangefinder’s clarity, contrast, and light transmission. Despite its 12 ounce weight, this Bushnell model is perfect for bow hunting. I was thoroughly impressed by this Bushnell’s outdoor performance. The secret behind its awesome performance is Bushnell’s patented Rainguard HD water-repellent lens coating that protects the rangefinder’s lens from water damage. Moreover, the optics of this rangefinder ar 100% water proof. Unlike other manufacturers, Bushnell is a company that puts its money where its mouth is. In this respect, you get a 100% money back guarantee. Purchasing a hunting rangefinder is a one-time investment. Thus, you have to dedicate a huge chunk of your time in research, or do you? To save you time, below are reviews of my two best hunting rangefinders. If you are looking for best deer rangefinder then these two will be the perfect match for you. Very few rangefinders can rival the Nikon 8397 ACULON in overall performance. What I found to be most astonishing about this laser rangefinder is its portability. Measuring 3.6 by 2.9 by 1.5 inches, this compact rangefinder is actually smaller than most smartphones. But the awesomeness does not end there, as this Nikon laser rangefinder is easy to operate as it requires only the push of a button to give you an accurate reading. Of the many laser rangefinders I have used, the Nikon ACULON is designed for long range hunting. This is because; Nikon equipped this ACULON model with Distant Target Priority Mode. With this technology, this laser rangefinder gives you the distance of the furthest object. The 6X 22 mm objective lens of this laser rangefinder is engineered to perfection. As such, you get better light transmission, courtesy of Nikon’s multilayer coated optics. Also, Nikon’s multilayer coated optics prevents loss of light due to reflection. Accompanying this laser rangefinder is a carrying case, a neck strap, a microfiber cloth and a CR2 battery. For a company known for innovative technologies, the Nikon ACULON was not all it is touted to be. This is especially so since it lacks some of the innovative technologies that other modern rangefinders boast of such as distance and slope compensation. I fell in love with the Bushnell Bone Collector Edition the first time I saw it. Its ornately decorated grayish exterior is rugged and water resistant while its one button operation makes it ideal for use in different terrains. The 4 x magnification lens has a range of 600 yards. In regards to clarity, this bone collector edition rangefinder does not disappoint It has an illuminated LCD indicator that is easy to view even in low visibility. Though Bushnell throws in a carrying case, the small size of this rangefinder makes it easy to carry and you might find the carrying case not to be useful. The Bone Collection's Realtree Xtra camo design makes it blend well in any setting. Also, this rangefinder switches between yards and meters for easy reading of measurements. This rangefinder weighs less than ten ounces and has a maximum range of 600 yards, which is quite impressive when you consider its price tag. One of the things I found to be a bummer with the Bushnell Michael Waddell, is its LCD display. This display lacks illumination and is, therefore, hard to read in low visibility. If there is anything I have learned as a hunter is to never rely greatly on a manufacturer’s claims regarding their products. This is especially so when it comes to rangefinders, where manufacturers have a tendency of exaggerating the yardage of their products. To counter some of the misleading claims made by manufacturers here is my unbiased reviews of four top rated best archery rangefinder. The Nikon Archers Choice Laser Rangefinder is what you get when you combine Nikon’s advanced optics technology with the experience of two professional archers from Archer’s Choice. At 18 mm, its eye relief is great and so is its 6X magnification. However, it is Nikon’s ID or Incline/Decline that makes it an ideal rangefinder for archery. This technology compensates for different incline and decline shooting angles. The benefit of this is that you are able to shoot accurately in any kind of terrain, whether on a steep hill or on a tree. Like all other Nikon rangefinder, this laser rangefinder is powered by a lithium-ion battery and is equipped with the manufacturer’s multicoated optics. This is also the best archery rangefinder. Without the battery, the rangefinder weighs 6.5 ounces and is both water and fog proof. Apart from being a great performer, this is also a cheap archery rangefinder that you can use any condition. Overall, this Nikon archery range finder offers great value for money. I have used many Bushnell rangefinders in my day, but few compare to the precision and light transmission of the Bushnell G-Force DX Rangefinder. The latter archery rangefinder is more accurate than most other laser rangefinders, thanks to Bushnell’s revolutionary G-Force DX technology. Thanks to this technology, this archery rangefinder can best be described as a laser rangefinder on steroids in terms of accuracy. This rangefinder’s innovativeness does not end there as it also features Bushnell’s Vivid Display Technology, abbreviated as VDT. This technology improves the image clarity of the Bushnell G-Force DX so that you get clear and accurate readings in low light. Other features synonymous with Bushnell that improves this rangefinder’s performance include the intuitive Incline/Decline technology, the Rain Guard HD lens treatment for protecting the lens from harsh weather conditions and the super sharp 6X, 21 mm objective lens. As a hunter who enjoys hunting with both rifles and bows, I was really pleased with the G-Force DX ARC’s Bow and rifle modes. With these two modes, you can customize this laser rangefinder to fit your needs. Thus, it can be used by both archers and gun-toting hunters. To ensure that this laser rangefinder can withstand the unpredictable wrath of Mother nature, Bushnell uses a rubber and metal housing to protect the rangefinder’s inner components. This resilient housing is rugged and waterproof. The compact and lightweight Simmons 801405 Rangefinder, 4x20LRF 600 rangefinder is yet another awesome piece of range finding hardware that I have always impressed me. An LCD display gives you the distance to your target from 10 to 600 yards. The 4X magnification lens is fully coated and deliver’s exceptional clarity and light transmission. While this is not the best archery rangefinder I have used, it is still a great rangefinder especially when you consider its price. Apart from being a cheap archery rangefinder, this Simmons model is also easy to operate courtesy of its one-button operation. In my experience, this is the best archery rangefinder in its price range. For easy carriage,carrying case is provided and weighs 9.8 ounces. In regards to its outdoor performance, the 801405 model has a great water resistant housing that protects it from the harshness of the rainy season. At first glance, the Wildgame Innovations Halo X Ray Z6X 600 Laser Range Finder, looks like something out of a George Lucas Sci-fi movie. However, this uniquely designed rangefinder is not just a good looking gadget as it is also a great performer. Wildgame Innovations did a great job on this intuitive range finder, which display’s measurements in both meters and yards. Moreover, you can adjust this archery rangefinder from angle to without angle. With angle, you get readings on both measurements and angle. The Wildgame Halo X Ray's inner components are housed in a tough plastic casing that is impervious to water. The nylon pouch that comes with this rangefinder is also waterproof. To affirm its status as a great rangefinder for archery, this rangefinder is ideal for both bow and rifle hunting and has a range of 600 yards. The source of the rangefinder’s power is one CR2 Lithium Ion battery that you have to purchase separately. To be honest with you, I am not good at golf, but I am good at writing golf rangefinder reviews. That being said, here is what I think about some of the top-ranked golfing rangefinders on the market. 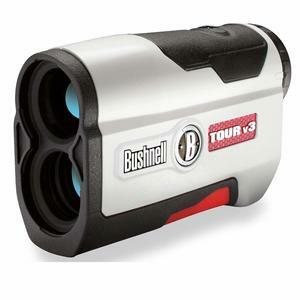 Allow me to introduce you to the Bushnell Tour V3 Rangefinders, a rangefinder designed specifically for use in golf courses. To accommodate the needs of different golfers, Bushnell offers this rangefinder in three versions, a 440-yard variant, a 550-yard variant, and an 800+ yard variant. One of the V3’s best features is its pin seeker technology. This technology gives you the ability to measure the distance between you and the flag with pinpoint accuracy. At the heart of its optical accuracy is a 5X magnification lens with 24mm objective. This rangefinder comes with a two-year warranty, a carrying case and is powered by a 3-volt battery. A glimpse at this rangefinder’s description on Bushnell’s official website reveals that it has a feature known as JOLT technology. However, this is not anything to be excited about as it provides the same information as the pin seeker technology, so it’s one and the same thing. This rangefinder is considered to be one of the best golf rangefinders. As you have probably already figured out, I am a big fan of Leupold rangefinder. So when I stumbled upon the Leupold GX3i Rangefinder I just had to buy it. Though this rangefinder is quite pricey, it was worth the investment. Instead of plastic and rubber, Leupold decided to go with aluminum, which I have to say is more rugged and durable than both rubber and plastic. Also, instead of the conventional LCD display that we have come to expect from rangefinders, Leupold opted for an OLED display. Due to its aluminum construction, this rangefinder weighs 7.7 ounces. The 6X magnification lens you get with this rangefinder is standard among golfing rangefinders. Similar to the Bushnell Tour V3, this Leupold rangefinder comes with a useful feature known as Pinhunter that filters readings from unwanted reflective objects. This ensures that you get only the readings you want. Sadly, Leupold’s decision to use an OLED display is not without its drawbacks. For starters, this screen is way too bright, so expect to experience an annoying blinking. Whether this is the best golf rangefinder out there considering its $ 400 plus price tag is subject to debate. As for me, the Leupold GX31 rangefinder is not the worst rangefinder I have ever used. If you are looking for the best golf rangefinder for the money, then the TecTecTec VPRO500 Golf Rangefinder is one you should consider buying. A relatively new entrant to the rangefinder market, the jury is still out on this Tec Tec Tec VPRO500. However, as far as I am concerned, this is a rangefinder that has the potential of giving other established brands a run for their money. One of the first things that impressed me with this rangefinder is how fast it returns yardage readings, I dare say it is as fast as most pricey Bushnell models I have used. It weighs 6.6 ounces and has a 6X magnification lens, which like I said before is the standard magnification for golfing rangefinders. In terms of ease of use, I found this rangefinder to be easy to use as all you need to do is press the power button and voila. For pinpoint accuracy press the mode button and you will get readings from the flag. This rangefinder I can call as best golf rangefinder for the money. If you are comfortable with buying new and relatively untested products, there is no reason you should not buy this rangefinder. The NIKON Nikon Coolshot 20 is a laser rangefinder that proves that size does not matter in regards to performance. This minute rangefinder is the successor of the Nikon Coolshot. Similar to all other golf rangefinders reviewed above, this small rangefinder has a 6X magnification lens. Additionally, this Nikon rangefinder has a feature similar to the PinHunter feature on the Leupold GX3i. Named the First Target Priority Mode, this technology gives you readings of the closest object making it easy for you to pinpoint the flag’s distance. Though according to Nikon the Coolshot 20 has a range of 550 yards, I found that it struggled with clarity beyond the 200-yard mark. The Coolshot 20 is powered by a CR-2 battery wich can last up to a month. Not everyone is a fan of cheap devices; some people are more attracted to high-end devices. If you are one of those people, then here are four rangefinders that you will not have a problem splashing money on. The Leica 1600-B is one of the priciest rangefinders I have ever used. This lightweight and compact rangefinder weighs 8 ounces and is made of carbon-reinforced plastic. Therefore, not only is it waterproof, but it is also fog-proof thanks to its nitrogen filled interior. Its unconventional design makes it easy to hold especially in the great outdoors. In terms of speed, this Leica rangefinder is significantly faster than most of its competitors. Since this is a high-end rangefinder, it features a 7X magnification lens with a 24 mm objective lens. In regards to range, it has a range of 1600 yards. To top it all off, this Leica model has an inbuilt thermometer for measuring temperature and even pressure. Although this is arguably the best rangefinder I have reviewed so far, it is also the priciest. And in a world where you can get great rangefinders for half its price, it might not be worth the price. But if you are leica fan and want to take advantage such speed clarity then you must go. The first Bushnell rangefinder to bear the Elite Tactical name, the Bushnell Tactical 7x26mm Laser Rangefinder is designed for long range shooting. This rangefinder comes with Bushnell’s Extreme Speed Precisions or ESP technology that gives it fast and precise processing of readings. The 202421’s 7X magnification lens is protected by Bushnell’s RainGuard water repellent coating. For clarity, this rangefinder features Bushnell’s revolutionary Vivid Display Technology that delivers clear images. If you use a tripod often, then you will be pleased with this model’s built-in tripod mount. The eye-cup is made from tough plastic and can be adjusted to accommodate glass wearers as well as those without glasses. This rangefinder measures 1.7 inches by 5.1 inches by 3.7 inches and features multi-coated optics. Of the three rangefinders reviewed under this category, the Redfield 117862 Raider Rangefinder 600A is the least costly. However, it can more than hold its own against its pricier counterparts. An improved version of the earlier Raider 500, this lightweight rangefinder boasts of a 600-yard range and a 6X magnification lens. Its built-in technology measures angle inclines and declines, meaning that you are able to compensate for inclinations and declines when making a shot. For clarity, this rangefinder is equipped with multi-coated optics. Included with the rangefinder package is a belt carrying case that makes it easy to carry. Arguably the smallest Redfield rangefinder, the 117862 model is powered by a CR-2 battery. This might be a good thing for golfers, but for enthusiastic hunters like myself, the size can be a drawback. Nevertheless, this Rangefinder performed well. If you are new to the world of rangefinders and are unwilling to spend more than $ 200 on one, then one of these three rangefinders are just what the doctor ordered. All the rangefinders in this list cost less than $ 200. Costing less than $200, not much is to be expected from the Simmons Simmons LRF 600 Tilt Intelligence laser Rangefinder. However, the LRF 600 lives up to Simmons’ reputation of producing high quality yet affordable optical instruments. Great for first timers and persons who are short on cash, the LRF 600 has some impressive features. One such feature is the tilt mode, which compensates for angle inclines. With this feature, you are able to get the true horizontal distance to your target. This Simmons rangefinder is particularly ideal for persons who hunt in close range quarters because of its low 4X magnification. The black LCD display is of average quality. As per my experience with this rangefinder, it has a maximum range of 400 yards, contrary to its proposed 600 yards range. Given that this is a rangefinder that costs less than $ 200, it lacks most of the sophisticated and useful features that most modern hunters rely on. If you have never used a rangefinder before, the SA Sports 7.26 Dragon Eyez 1500 Yard Rangefinder is one I strongly recommend. In addition to its low price, this rangefinder is lightweight and comes with some pretty amazing features. For starters, you get a 7X magnification lens, which is quite impressive considering the Dragon Eyez price tag, and a decent field of view of up to 105 yards. The LCD display on this model is great and so is the 25 mm objective lens. Other accessories that come with this low-cost rangefinder include a carrying case and a lanyard. Powering this rangefinder are two AAA batteries. Capable of displaying measurements in meters and yards, this rangefinder weighs 6 ounces and measures 5 inches by 2 inches by 7 inches. As for range, the true outdoor range of this rangefinder is 800 yards. One of the cheapest laser rangefinders out there, the Wildgame Innovations Halo XRT Laser Rangefinder is truly a work of art. Though it is not the lightest rangefinder on the market, it is still pretty light as it weighs 11 ounces. While Wildgame claims that this device has a range of 500 yards, it struggled to get readings beyond the 250-yard mark, especially when targeting large game. Of worth noting is that its 6X magnification is quite impressive for its price segment. The Halo XRT’s scan mode for measuring the distance of different objects is a plus in my opinion. Wildgame had to cut costs in order to make this a reasonably priced device. In this regard, the Halo XRT is not easy to use. This is because it can only be focused using an ocular knob, hence you will have to use your two hands to operate it. The LCD display lacks illumination, which makes it difficult to view readings in low lighting. There comes a time when we all feel the urge to buy a pricier rangefinder than the one we own. Thus, if all your rangefinders cost less than $ 200, it may be time to upgrade to pricier models. However, you might not be ready to spend more than $ 500 on a rangefinder. If you are that person, then this compilation is for you. The Vortex Optics Ranger 1000 RRF-101 can best be described as a rangefinder that has all you need for a hunt. Thus, while it is not the priciest or the best for that matter, it is still a great purchase. The lenses are multi-coated and anti-reflective to ensure that you get an awesome view, and while its design is not the most appealing, it’s not the worst. With a 6X magnification, the RFR-101 will help you get distances of targets as far 1000 yards. Also, its 17 mm eye relief is a plus. The RFR 101 weighs 12 ounces and gives readings compensative of incline angles. Though it has a durable and waterproof construction, it is not the easiest rangefinder I have used. I found the two-button operation to be a bit confusing. Also, the accompanying carrying case could do with some improvements. The Leupold 112179 TBR W/DNA is one of those rangefinders that I found to be too good to be true. For starters, Leupold invested in a quality O-LED display, which puts the displays of other similarly priced rangefinders to shame. In addition to a new display, this Leupold rangefinder also comes with a new and advanced processing system. Codenamed DNA or Digitally enhanced Accuracy, this technology gives the RX-1001 incredibly fast processing of readings. Amazingly, this rangefinder is made from aluminum and a rubber material that acts as a shock absorber. Therefore, it is not only a great performer but it also looks great. Built into it is an inclinometer that compensates for inclines and declines to give you an accurate horizontal reading. Though Leupold gives this rangefinder a range of 1000 yards, it does not go beyond 600 yards. One of the newest additions to Nikon’s line of laser rangefinders is the Nikon Pro - Waterproof Laser Rangefinder. This pocket-friendly rangefinder has many different modes. As such, this rangefinder will not only tell you how far away a target is but also its height, how far above or below the target is from your eye. One of the great additions that Nikon made to this rangefinder is an external LCD display that displays all results. The internal display will only show the selected results. The 6X magnification lens is multicoated to deliver high-quality images while the entire unit is waterproof up to 1 meter. Capable of displaying readings in both yards and meters, this laser rangefinder can be overwhelming to use. This is because it is operated using a single button. Thus, you might fight switching to the rangefinder’s made modes quite tricky. Personally, it took some time to get used to the different modes available. The Forestry Pro is powered by a CR-2 battery. Generally, the Nikon Forestry Pro is a great rangefinder, especially for hunting. 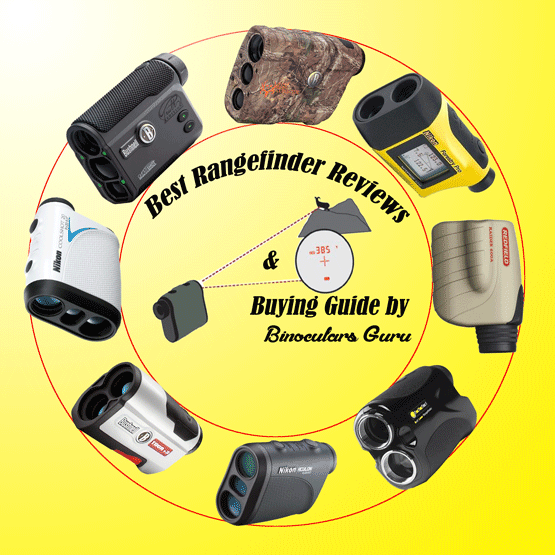 In conclusion, all the above-reviewed rangefinders are designed for different applications. Therefore, whether you are looking for a great bow hunting rangefinder or a simple rangefinder for golfing, I do believe you can find the most appropriate rangefinder from my list. This is the right website for anyone who wishes to find out about Rangefinder. Thanks Jens Kraker. We Appreciate your thought. Keep Reading Us! Hi I have the vangaurd endeavor hd20x60x82mm and I really like it and the way it balances on the sunpak pistol grip carbon fiber tripod I just wonder why it never gets mentioned or any credit on any of the hunting forums ,so thank you for your review. As far a laser range finders I am surprised you did not bring up any of the Sig kilos especially the new 2400. Copyright text 2019 by Binoculars Guru - "All brand names and images are Registered Trademarks of their respective companies. All manufacturers names, numbers, symbols and descriptions are used for reference purposes only, and it is not implied that any part listed is the product of these manufacturers or approved by any of these manufacturers."